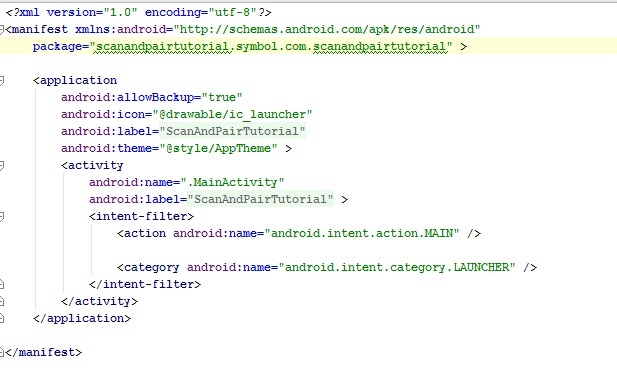 This guide will walk you through creating an EMDK For Android application that will use ScanAndPair APIs introduced in EMDK V 3.1, to perform pairing of any remote Scanning device by Scanning its Bluetooth Name or Bluetooth Address. The API uses Scan and Pair Manager, which is the primary object that allows pairing with remote scanning devices. In this tutorial, we will explore the ScanAndPair APIs by using it for developing a basic application that will scan Bluetooth Name/Address of a Remote Scanning device (Ex. MC40) and pair itself with this device through bluetooth name or address scanned by discovering it. Note: The ScanAndPair API does not use Profile Wizard to scan and pair remote device and everything needs to be configured programmatically through code. Note: Provide "ScanAndPairTutorial" as the project name for this tutorial. 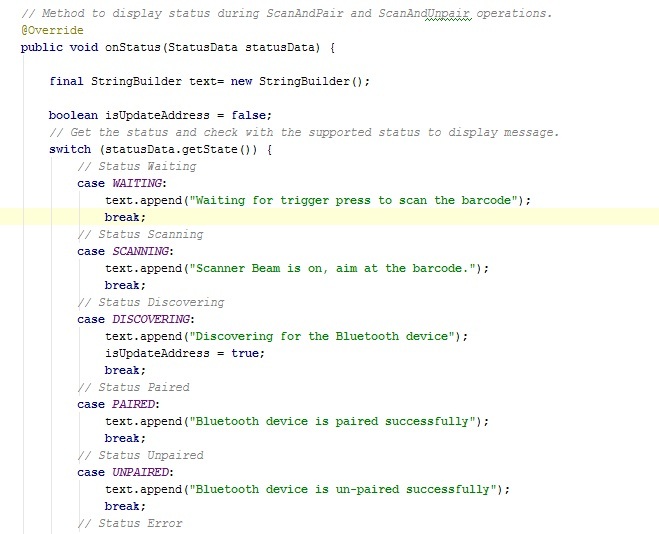 Then you must make the activity to implement EMDKListener. After that you also need to implement ScanAndPairManager.StatusListener, which is an interface for informing client applications to notify Scan and Pair or Scan and Unpair events. Override its onStatus function. The onStatus is a callback method that would be called when a scan and pair or unpair status event occurs. We will now create some global variables to hold the instance objects of EMDKManager and ScanAndPairManager. These variables would be used throughout the code. We will then add some UI elements starting with a TextView to display the status of Scan and Pair operation and then EditText that will display the scanned Bluetooth Name/Address of Remote Scanning device or allow user to enter Bluetooth Name/Address of Remote Scanning device with which your Symbol device needs to be paired using Scan and Pair APIs. The UI would have a Spinner that would specify what type of data (Bluetooth Name or Bluetooth Address) of Remote Scanning device, the client application needs to scan prior to pairing with that Remote device. The User Interface would also have two Check Boxes that would be explained later while adding UI code. Of course, the UI will have Buttons to apply settings and start operation of Scan and Pair or Unpair. // Text View to hold Bluetooth Name of Remote Scanning device to pair with. // Text View to hold Bluetooth Address of Remote Scanning Device to pair with. // Bluetooth Name/Address of Remote Scanning device to pair with. // Scanning device to pair with. // Button to Pair the client application device with Remote Scanning device. // Button to Unpair the client application device with Remote Scanning device. // device will be used to pair. // An interface for notifying client applications to notify scan and pair or unpair events. Now, let us design a simple UI that has components explained above. In the onCreate method, we take reference of UI elements that are declared in "res/layout/activity_main.xml" in order to use them in our Activity. We then call getEMDKManager so that the EMDK can be initialized and checked to see if it is ready. We will then set the ArrayAdapter that has a list of Scan data types of the Remote Scanner device to the Spinner. Finally, we would add methods calls to handle buttons and check boxes events. // The EMDKManager object creation and object will be returned in the callback. // Method call to register onChecked listener of both checkboxes. Get the EMDK Manager in the onOpened method and update the StatusView TextView with a message by adding following code in onOpened method. 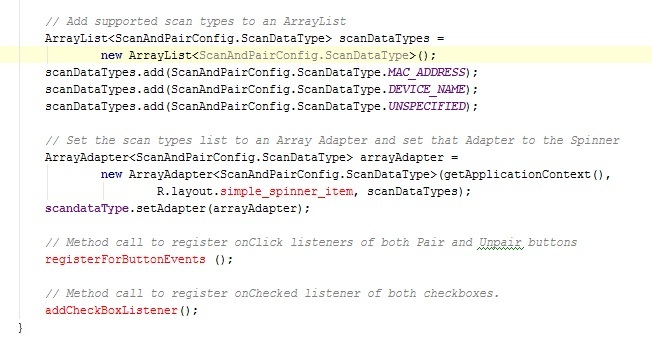 You will see few errors as we have not created the layout for ArrayAdapter and also not created onClick and onChecked listener methods. Let us resolve the errors by first creating the layout for Array Adapter. So go to res -> layout and add a new file simple_spinner_item.xml file. Add following code to this file. 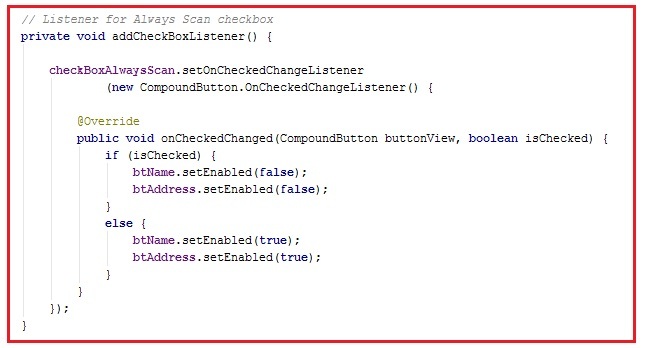 Lets add the addCheckBoxListener method that would handle check box event for "Always Scan" checkbox. If this check box is checked, we will disable the Bluetooth Name and Address EditTexts so that these two parameters can be provided by scanning Remote Scanning device and not by the user. If "Always Scan" check box is unchecked, we will enable the Bluetooth Name and Address EditTexts because user will have to enter these details of Remote Scanning device prior to pairing. This checkbox is related to scanAndPairMgr.config.alwaysScan field of ScanAndPair API that would be explained later. You can still see one error. So lets add registerForButtonEvents method to get rid of this error. registerForButtonEvents method contains onClick listener method calls of both "Pair" and "Unpair" buttons. // Method that calls onClick listener methods for Pair and Unpair buttons. This is the most important part of this tutorial as these two methods would allow you to pair and unpair this client application with Remote Scanning device (Ex. MC40). 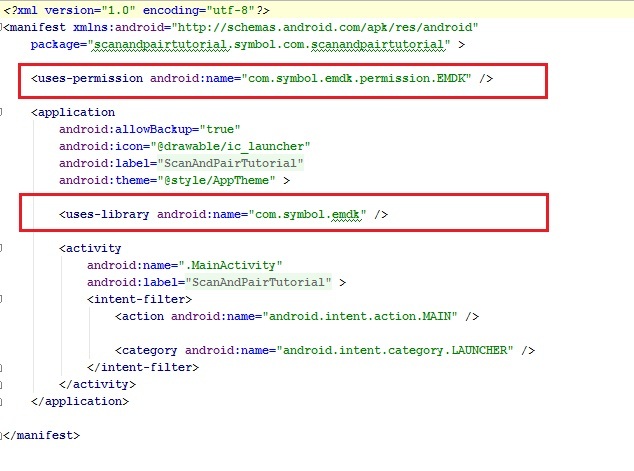 Lets add these two methods starting with addScanAndPairButtonEvents. First get the scanAndPairButton reference, set the onClickListener and override onClick method. In case of Scan and Pair, we would get an instance of ScanAndPairManager first. On this instance, set the status listener to get the status of Scan and Pair operations. We would then set the scanAndPairMgr.config.alwaysScan parameter. The ScanAndPairManager.config.alwaysScan field determines if a scan will be performed to get the Bluetooth Name/Address of the Remote device or the user itself has to enter Bluetooth Name/Address to pair with the Remote device. If ScanAndPairManager.config.alwaysScan is set to true, a scan is always performed when these methods are called. By default it is set to true. So scanning a Bluetooth barcode is required by default. 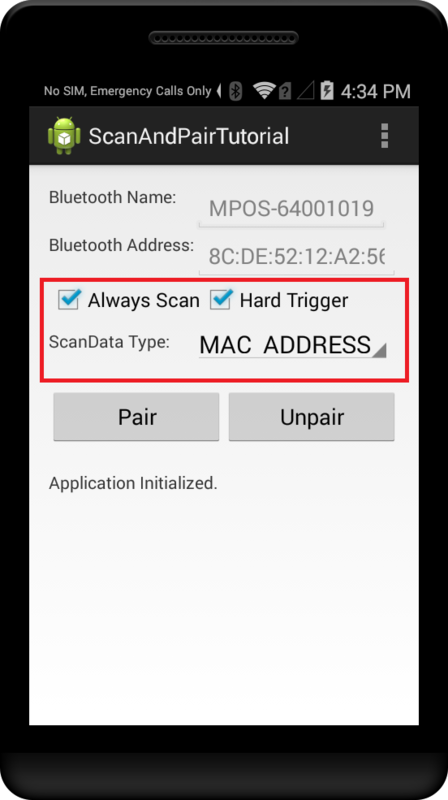 If ScanAndPairManager.config.alwaysScan is set to false, then scanning is skipped and the ScanAndPairMgr.config.bluetoothInfo.deviceName or scanAndPairMgr.config.bluetoothInfo.macAddress field provided by the user are directly taken for pairing. checkBoxAlwaysScan checkbox determines the status of scanAndPairMgr.config.alwaysScan. Set the Notification Type to indicate the progress of ScanAndPair or ScanAndUnpair operations. If checkBoxAlwaysScan checkbox is checked, we would perform a scan to get the Bluetooth Name/Address of the Remote device for pairing. So set the timeout that specifies the duration within which a Bluetooth Barcode should be scanned (Ex. 5 seconds). Later if the checkboxHardTrigger is checked, we would set TriggerType.HARD as trigger type, else set trigger type as TriggerType.SOFT. Set type of data the application is going to scan (Ex. Bluetooth Name or Bluetooth Address). Call scanAndPair method and get the result in ScanAndPairResults. This is an asynchronous method. The status of the scanAndPair() method will be returned if the callback is registered. If the always scan is enabled in the configuration, this method scans a barcode to get the Bluetooth address or name of a remote device, and pairs with that remote device. 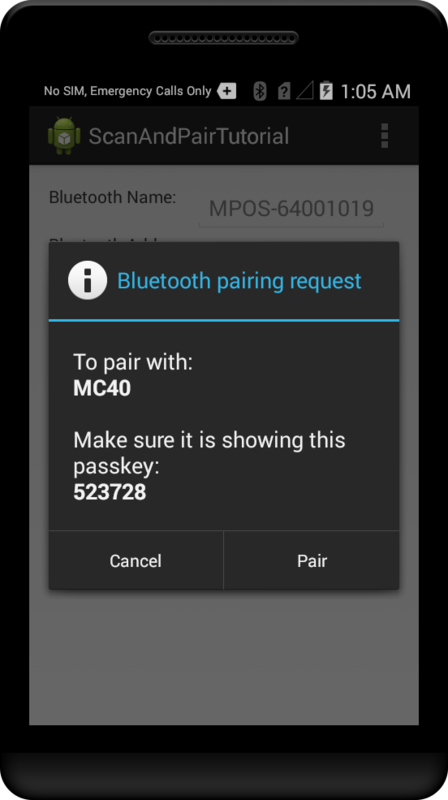 If a Bluetooth address is scanned, the remote device is paired without performing a discovery. If a Bluetooth name is scanned, then a discovery is done to find the address of the device and then the pairing is done. The provided authentication PIN is used for pairing. The maximum allowed length for the authentication PIN is 15 characters. Note: We have provided "0000", which is a default value. Finally, we would update the Status of operations in statusView using ScanAndPairResults. // Update the status on StatusView. scanAndUnpair is an asynchronous method and its status will be returned if the callback is registered. If the always scan is enabled in the configuration, this method scans a barcode to get the Bluetooth address or name of a remote device, and unpairs with that remote device. 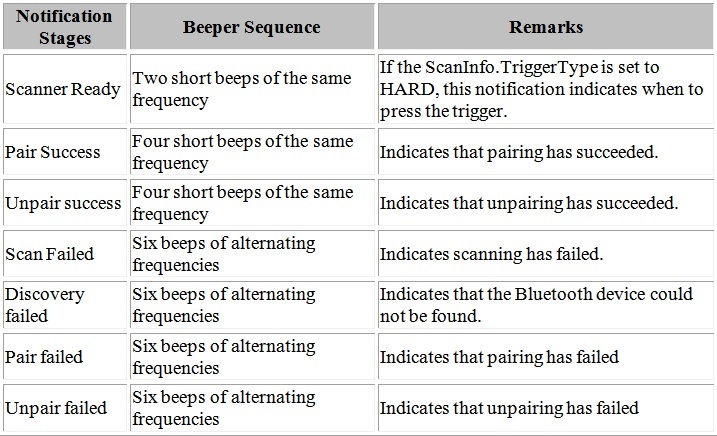 If a Bluetooth address was scanned for pairing during scanAndPair() calls, then the same address can be scanned for unpairing during the ScanAndUnPair() call. This operation would be performed when the user presses Unpair button. Hence we would get the reference of scanAndUnpairButton in this method. In this step, we would write all the possible status that could be received during ScanAndPair and ScanAndUnpair operations in the onStatus method. We have added status listeners in both ScanAndPair and ScanAndUnpair methods so that we can track different status when these operations are performed and display them on statusView to notify user. The statusData.getState() method provides all the states we can get during pairing and unpairing operations. Following is the code of onStatus that mentions all the states and display them in the statusView TextView on the UI thread. // Method to display status during ScanAndPair and ScanAndUnpair operations. // Get the status and check with the supported status to display message. That's it!!! 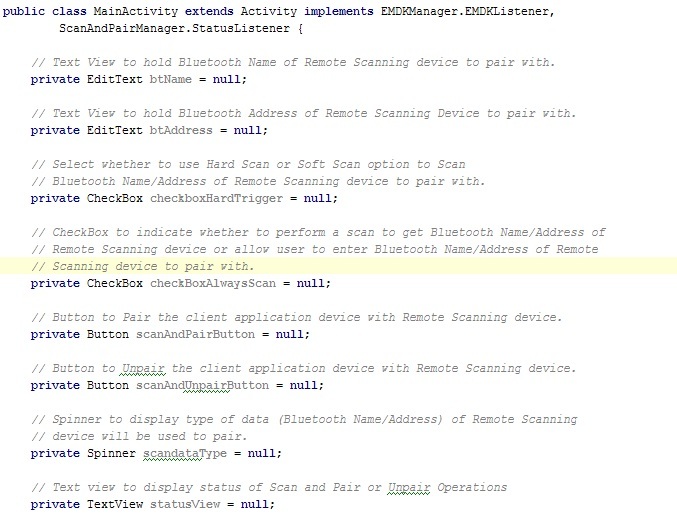 We are done with all the coding part that will let us scan the Bluetooth Name/Address of Remote Scanning device and pair our client application with that Remote device using ScanAndPair APIs introduced in EMDK V 3.1. Now let us run the application. 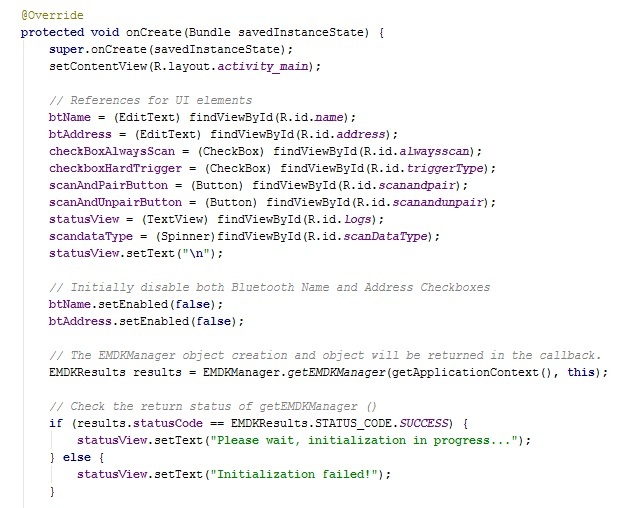 You can see a message on the "StatusView" that indicates EMDK Manager has been successfully initialized. We want to scan and not type, the Bluetooth Address of Remote Scanning device (Ex. MC40) with which we would pair our device having this client application. So keep the "Always Scan" checkbox checked. We would scan the Bluetooth Address of Remote Scanning device. So select MAC ADDRESS option from "ScanData Type" spinner. Now press "Pair" button and it would start the pairing process by notifying the intermediate status in the "statusView" TextView. Now press the Hard Scan key to scan Bluetooth Address of the Remote Scanning device. The following is the Barcode that has the MAC Address of Remote Scanning Device (Ex. MC40). Scan this Barcode and your device (Ex. TC55) would be successfully paired with the Remote Scanning Device (Ex. MC40). Click "Pair" button on both devices (Mobile and Remote Scanning Device). You can see the "statusView" with a success message. 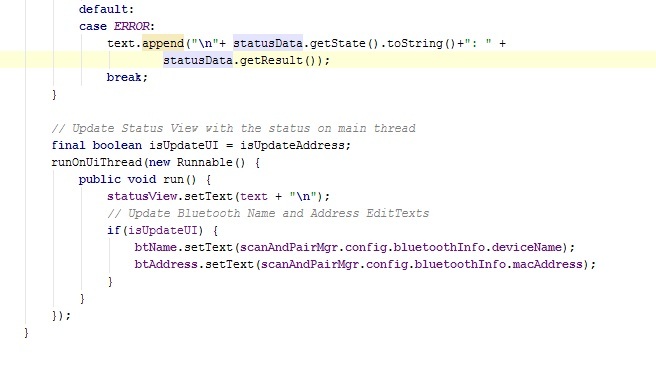 Now let's confirm this by going to device's Settings -> Bluetooth. 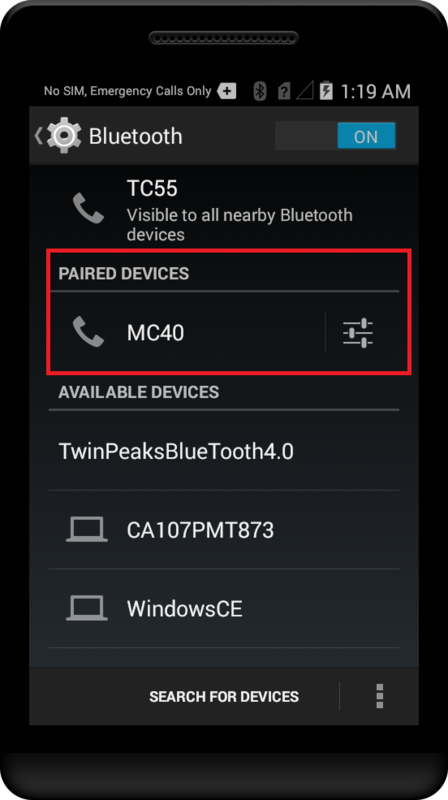 You can see that MC40 has been successfully paired under "PAIRED DEVICES" section of your device. Now that you have learned how to scan the Bluetooth Name/Address of Remote Scanning device and pair our client application with that Remote device using ScanAndPair APIs, in the next tutorial we would concentrate on SimulScan APIs and develop an application to demonstrate its use.